The aluminum oval carabiner is the single most useful rafting item ever. And as most river runners know you can never have too many straps or carabiners. These top quality climbing carabiners have many uses but are a must for setting up any kind of river rescue. 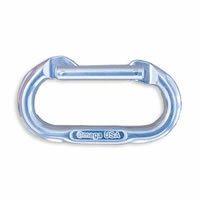 The Oval Carabiner features a spring loaded gate. We recommend your "wrap kit" to include at least six carabiners.